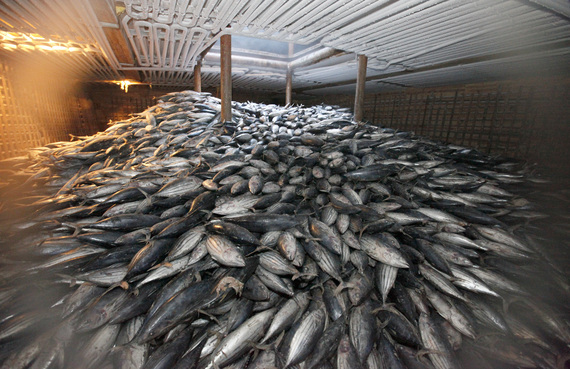 We are all aware of the crisis in world fisheries that has brought many species to the verge of extinction. Fishing is, of course, big business. According to a Hamilton Project report based on U.S. National Marine Fisheries Service statistics, fishing in the U.S. represents some $90 billion in annual revenues and supports over one and half million jobs. The National Oceanic and Atmospheric Administration classifies 17% of US fisheries as "overfished," and resource management schemes, applied by zones and species, are at the center of an industry response to this serious natural resource challenge. What is astonishing is that, beyond national catch, an estimated 94% of seafood consumed in the United States is imported from foreign suppliers. In reality then, American demand is up, national supply is inadequate and foreign fishers, often operating without harvest limits, are providing an enormous majority of the product we eat. The paradox is obvious: Whatever we do to sustain the national industry will be countered by external suppliers operating outside sustainability management regimes to meet an ever-growing market demand. Historically, management regulations were usually established by permits for controlled entry into area waters, limited season lengths, and catch quotas -- procedures that have proven controversial and inadequate. A new approach, called catch shares, is a management system that assigns "property values to various stakeholders, including individuals, communities and cooperatives, with the goal of establishing incentives to promote long-term sustainability of fish stocks." The Hamilton Report further explains: "Catch shares are a family of policies... that can be customized to the particular circumstances of a community. All catch shares enable fishery management councils to establish the total amount of fish that can be caught based on sustainability criteria. But catch shares differ in their implementation. One version... assigns trade-able fishing rights to individuals, giving each fisherman a share of the total allowable catch. This design aims to encourage fishermen with low costs to purchase shares from those with high costs, improving catch efficiency while compensating those who choose to sell their shares. Another type of catch shares allows a group of fishermen to explicitly cooperate on harvest strategies, co-management, and marketing. And yet another type gives a fishing community an exclusive privilege to harvest a designated area of the ocean." Today, despite some criticism and objection to consolidation, a bias against smaller operators, and the decline in related new boat construction, roughly half of the fish caught in the U.S. is harvested from a fishery under catch share management. All this, nonetheless, does not address the resultant threat to the economic stability of the industry. Is there anything to be done? Well, yes, there might be another way to "invent" additional value to the given catch in whatever amount by using every fish, and every part of those fish, as a new contribution to the total revenue. According to "Wasted Catch: Unsolved Problems in U.S. Fisheries," an excellent study by Oceana, "global by-catch may amount to 40 percent of the world's catch, totaling 63 billion pounds per year. Some fisheries discard more fish at sea than what they bring to port, in addition to injuring and killing thousands of whales, dolphins, seals, sea turtles and sharks each year. While by-catch data is often outdated and incorrect, researchers estimate that 17-22 percent of U.S. catch is discarded every year and...could amount to two billion pounds every year, equivalent to the entire annual catch of many other fishing nations around the world." So there is one step to be taken: find more value in the 20% of the fish already taken -- as fertilizer or fish oil or fish feed -- a market value now abandoned for lack of innovation or effort. Further, the Iceland Ocean Cluster, a cooperative of start-up marine-based companies, has taken a second, even more imaginative step -- the utilization of 100% of every fish taken - - fillets for traditional food processing, roes and milt for caviar and other food products, liver for canned goods and pate, fish oils and intestines for enzymes in skin creams, cosmetics, and medical products, livers for Omega-3 oil in capsules, skin transformed into leather for clothing, medical products and collagen, and heads and bones dried and transformed into protein and supplements for export to Asian markets. All these revenues are new, measured in new employment and increased return from an existing product by creating demand for an existing resource. All this value is available to the industry now, without another fish taken.